Our article is a brief review of the Bowflex Treadclimber TC100 and its top features, specifications, and advantages. This workout machine can be your best bet as long as you plan to work hard at home. It is highly effective when it comes to low-impact exercises because it can really help you burn calories while being gentle on the joints. 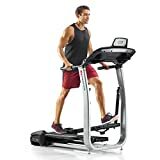 This 3-in-1 cardio machine which features a dual-tread system can be used as a stepper, elliptical, and treadmill all in one. While there are multiple traditional treadmills to choose from in the market, the TC100 sports all the features of a top-of-the-line model without breaking the bank. It features a built-in USB charging port which you can use to recharge your music player and other electronics that you may be using while exercising. It allows a maximum speed of 4 miles per hour, which is ideal for burning calories. The machine is very compact making it an easy fit in a small spaced room, apartment, or storage area. It has two treadles that have been fitted with a moving belt for ease of use. The machine’s construction is designed to help you burn 2.5 times more calories than the conventional treadmills do. The TC100 has a rear machine step platform that you can use to stay safe as you go about your routine. The machine has 12 resistance levels for all the 3-in-1 motions. Adjust the resistance level as your muscles and body get toned for faster results. There is also an LED display which shows valuable data like time, speed, distance, and calories burned in the process. This info will help you keep track of your progress, which is further complemented by the goal tracking function. The in-built mini-computer can store and effectively track data from two different users. On the TC100, you can perform three low-impact exercises which include walking and stair climbing. These cardio exercises will help you lose tons of calories, tone your muscles, and keep fit. You should start off with a low resistance 10-minute exercise before adjusting to a higher resistance for five minutes as you progress with your workout plan. For better results, alternate the low impact and intense workout schedules after every half an hour. Check the machine before using it to ensure that there are no broken, worn out, or loose parts. After each use, dust and wipe off any moisture from the machine with a cloth. Remember to unplug the treadclimber before wiping. On a weekly basis, use a damp cloth to clean the belt for smooth rolling. Remember to keep the Console moisture-free. Check the screws and bolts every month to ensure that they are sufficiently tight. Also, lube the belt and deck system lightly, moderately, and heavily after every 3, 2, and 1 month respectively. The manufacturer recommends the Lube-N-Walk treadmill lubrication kit for this machine. The TC100 comes with a two-year warranty during which time all maintenance expenses will get full coverage. Bowflex offers a 6-week trial period for the machine that you can use to determine whether you made the right decision. If by any chance you do not find it satisfactory, you can return it and get a full refund. This is usually a great customer catch. You can use a music player, phone, or tablet to make workout sessions more engaging, but these are not included in the package. Since the machine requires assembly, consult the manual first to ensure that every piece is in the right place. You should also use the right workout gear like a good pair of running shoes to enhance your safety as you exercise. It is compact thus portable, easy to store, and does not take up a lot of space during use. The workout plans offered by this machine are low standard. While the Bowflex TreadClimber TC100 proposes a design with multiple features and functions which are invaluable in a proper workout plan, users can only train based on walking exercises with this one. Nonetheless, despite its drawbacks, most users agree that the TC100 is still a great exercising machine. Check out this testimonial from Shelly, a happy customer who lost 40 pounds in four months with the Bowflex treadclimber! The Bowflex TreadClimber TC100 is a welcome upgrade to the Bowflex TreadClimber TC10, and it features many improvements, especially on the console area. The price is quite reasonable considering its great functions. Although the basic features could use some adjustments to fit the needs of some users, one cannot deny the amazing workout capabilities you can get from this machine. It is a great option for those of us who love walking to burn calories, keep fit, and enjoy their workout session. Based on its reviews, we can conclude that TC100 is a reliable TreadClimber that is not only very user-friendly but also highly effective.